Gemma's charity for others made her the angel of kindness and love. She practised this virtue over a wide field according to the circumstances in which she found herself. Gemma’s great love for God was the inspiring motive behind her charity towards her neighbour. 'Her life was a continual prayer,' said Father Gentile Pardini, a Franciscan who knew her very well and who often heard her confession. 'For her the Crucifix was a book.' 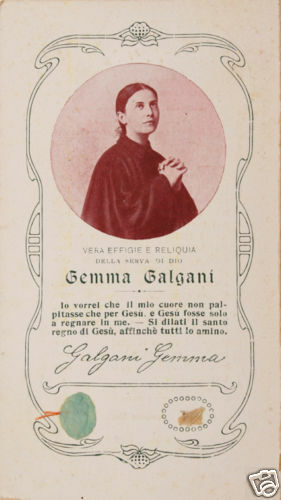 According to another witness ‘Gemma's thoughts were always centered upon God. Every day she made a meditation upon one of the mysteries of Faith, most often upon the Passion and Death of Jesus Christ’. This witness further testified to the occasions where she found Gemma ‘in a chair rapt in profound recollection as she looked at a picture of Our Lady of Sorrows which she held in her hand.’ Ths love for Jesus and Mary inspired her to love others out of love for Them. Besides the old man already mentioned, there was I young country girl to whom Gemma gave a coat, and another person for whom she procured some Marsala wine when he was sick. These acts of charity made her Aunt Elisa uneasy, and she told Gemma that if she continued to be so liberal she would leave nothing for herself. Gemma replied calmly that one coat was all she needed. Gemma writes in her Autobiography"
"We entered on the year 1897, I alone, without heart [she used these words to hide what in her was heroic virtue], remained unmoved by so many misfortunes. That which most grieved the others [note: the others, not herself] after Papa's fatal illness, was to be left without means. I understood one morning the greatness of the sacrifice that Jesus required at once, and I shed many tears. But Jesus, during those days of sorrow, made Himself all the more sensibly present in my soul; and even from seeing Papa so resigned to die, I drew such strength that I bore this bitter separation with great tranquillity. The day he died, Jesus forbade me to give way to useless grief, and I spent it in prayer, fully resigned to the most Holy Will of God, who then became my earthly and heavenly Father." But in her love of suffering in silence and her charity for others Gemma did not give all the details of what happened around the deathbed of that honest and upright man, while his seven children looked on helplessly, stunned by the blow they had received. It seems impossible that men should be so cruel, or that greed for money should so deaden the most elementary feelings of compassion. ‘The family was ruined and at times reduced to such straits that it was necessary to solicit help from others ... to beg. Elisa Galgani told me that it was she who went out to try and get something for a family that was dying of hunger, and how she met a man who gave her a franc with which she bought a loaf of bread and a few things to bring home. Gemma, however, was not appalled by the poverty to which she and her family were reduced, because she considered poverty and the sorrows of life as precious gifts from God-as an ignored inheritance reserved by Him for the elect. According to her own account she tried to bear the heaviest burdens that arose from this state of affairs and to alleviate the sufferings which the others endured as a result of their poverty. 'No matter how small it was,' said Elisa Galgani, 'Gemma always reserved the smallest portion for herself.' And another witness declared I hat she ate very little in order to have more to give to her brothers. 'In these sad circumstances Gemma found a means of exciting even myself to have confidence in the Providence of God. She used to say to me: "Say the Rosary of five decades with these words: 'Providence of God, have mercy on me.' When you have said that ten times, add: 'Providence of God, Thou has provided for me,' or, 'Providence of God, He will provide.' "
Gemma also expressed the same sentiments to her Aunt Elisa, 'Have patience, have patience, God will provide.' And after reviewing the historical record of this time in Gemma’s life we see that God always did provide. 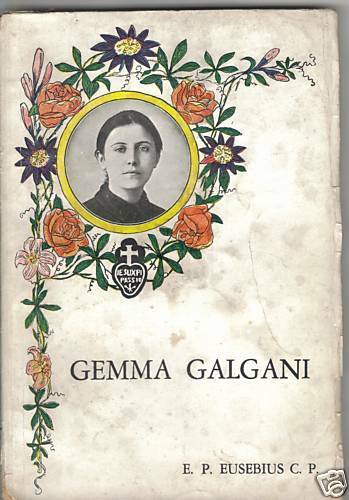 -Primary Source is the excellent book “Blessed Gemma Galgani” by Padre Amedeo, C.P. ,translated by Osmund Thorpe C.P., 1935. Dear gentle St Gemma who loved others so much, please pray for all the victims of sexual abuse by Catholic priests. You with your compassionate heart must see and know the depth of the suffering this betrayal of innocence inflicts. May they be lifted into the arms of God's love and learn to trust again, like the innocent little children they once were. May their wounds become doors into the heart of Jesus.